Your objective is to get the attention quickly of your future employer. 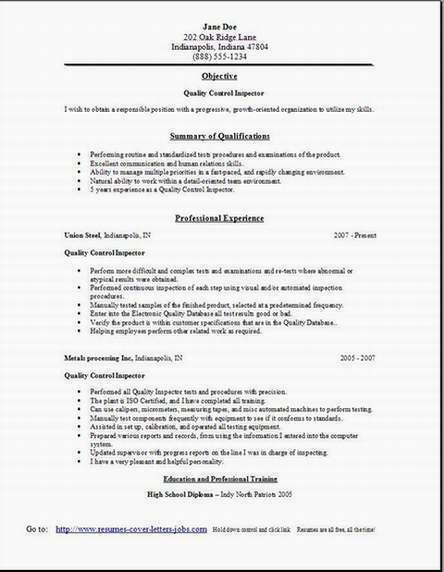 This example resume will help you to capture that goal. Yes, you need to replace all the example resume info with your own. 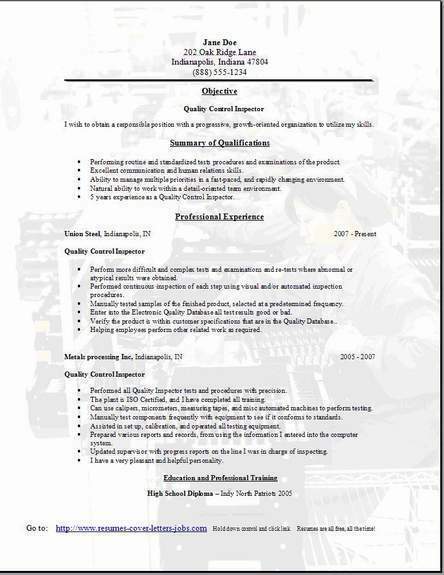 The info provided on the example resume so you can see the resume format upon completion. 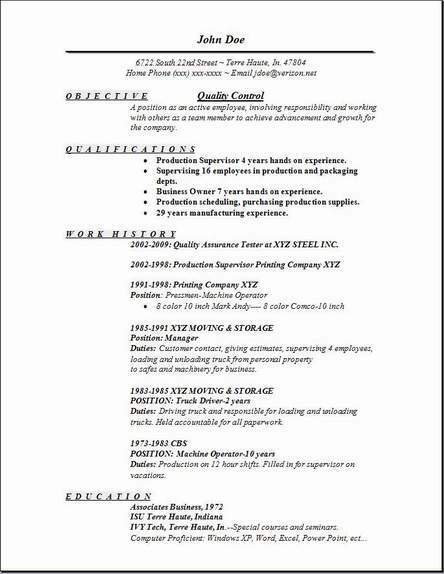 So when you are finished adding your work history, your completed resume will look almost identical to the example in layout anyway. The purpose of the QA Tester Resume is to highlight your performance skills in the collection of, and your testing skills on all collected fluid samples from all of your employers manufacturing process lines, and also any secondary processes they would like tested. The Quality Testers in a production environment, perform analytical testing on all of these fluids, using various chemicals and formulas during the testing. All testing is completed in the laboratory, a self contained building, with a ductless recirculatory vent hood enclosure. No emissions escape from the laboratory as they are filtered with 2 large filters in the unit itself. All filters are replaced every 6 months or sooner if needed. They help protect you during your testing with various chemicals. Some of the testing you use in this job are all geared towards analyzing the liquids in the production machines to maintain the standards that are set to optimize there efficiency. For instance (iron parts per million), (Acid concentration percent), how much the liquid is contaminated by other substances. All testing information upon completion is entered into your future employer's computer database that is available for all to see. Charts can be created for further analysis. If you are very good with analytical formulas and chemicals, beakers and flask used for measuring, then make sure to put this info on your qa tester resume sample one, you are one step closer to getting chosen for an interview for this qa tester job position. I know that these free qa tester resume sample one are a must have and very useful to you. They will look very neat and professional when you are done. A position as an active QA Tester employee, involving responsibility and working with others as a team member to achieve advancement and growth for the company. • Performing all routine test procedures and inspections of the final product. • Excellent at communicating with teammates in production. • Ability to perform fast-paced testing, with quick real time analytical results. • 5 years of efficient quality experience as a QA Tester. • Perform very difficult and very complex testing, re-tests of the products are common. • Performed selected time scheduled testing and inspection procedures. • Manually testing many samples of all finished product, selected during a time period set for the day. • Enter all test results to a Database, even the good or bad results for evaluation. • Verify customer specifications of the product per customers P.O. • Performed testing procedures with highly efficient precision. • The plant is ISO Certified, and I have studied and completed the companies training program. • Can use calipers, micrometers, measuring tapes, and misc automated machines to perform testing. • Manually test components frequently with equipment to see if it conforms to standards. • Assisted in set up, calibration, and operated all testing equipment. • Prepared lots of reports and critical records, also using that data to create excel charts. Indiana IVY Tech, Terre Haute, In.--Attended various seminars. Read specifications and set points of machine fluids. Monitor machine operations to ensure quality standards. Recommend quality adjustments to all production process. Inspect, test, and measure all products being produced. Measure products using various high tech equipment such as micrometers. Accept or also reject the finished items. Remove and fix all products that fail quality inspection. Have meetings about the results with production, who is responsible for the products. Report all inspection and all test data criteria to supervisor.